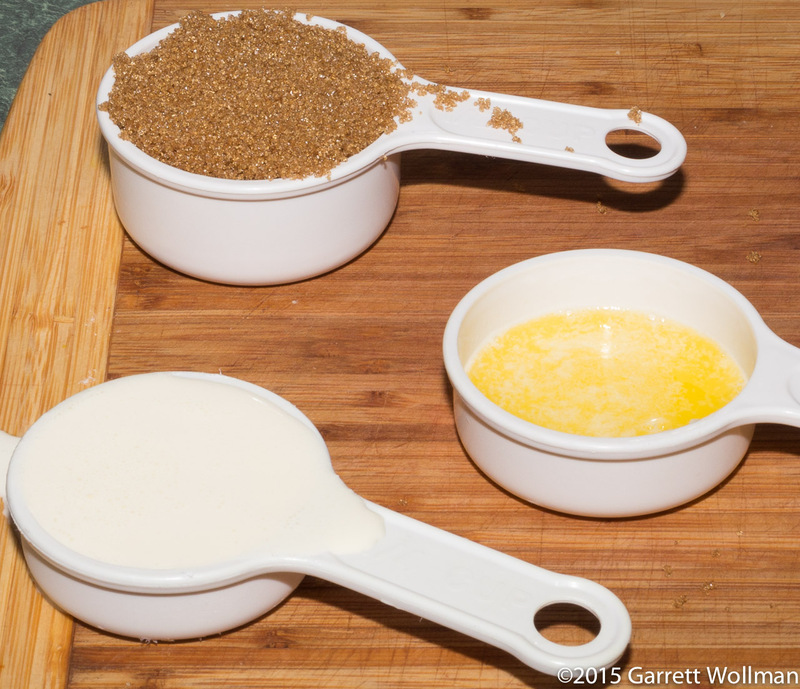 This recipe calls for a simple graham-cracker crumb crust: a few tablespoons of sugar, three ounces of melted butter, and 1½ cups of graham-cracker crumbs. To get the crumbs (ground up in the food processor) it takes about one package of crackers — sorry, but I didn’t weigh them. These are all just stirred together and pressed into the springform pan, then baked off at 375°F (190°C) for about ten minutes. 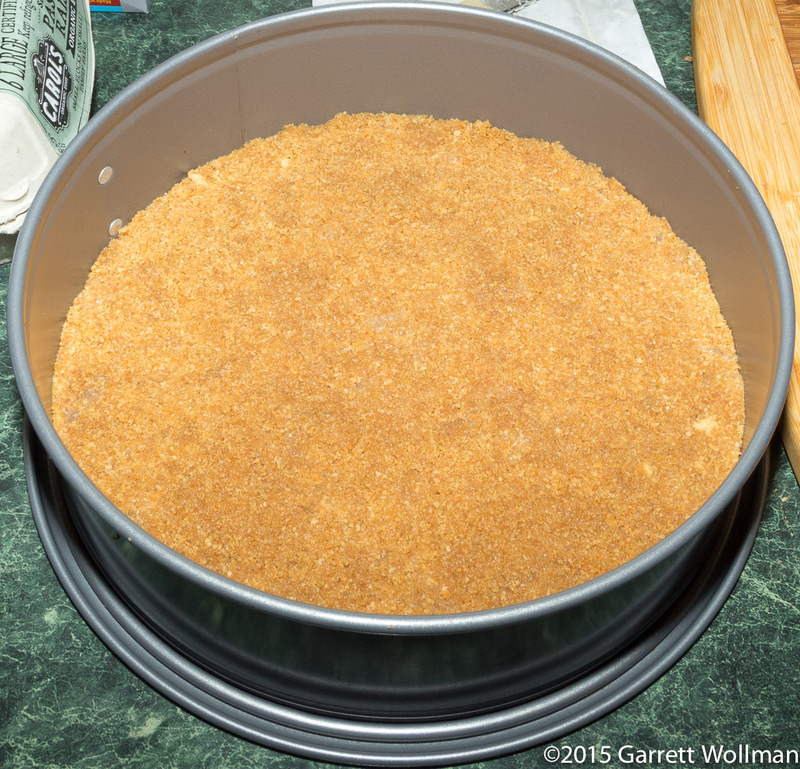 I actually used the smooth side of my meat pounder to press the crumb crust flat. After cooking, it’s taken on a bit of color. 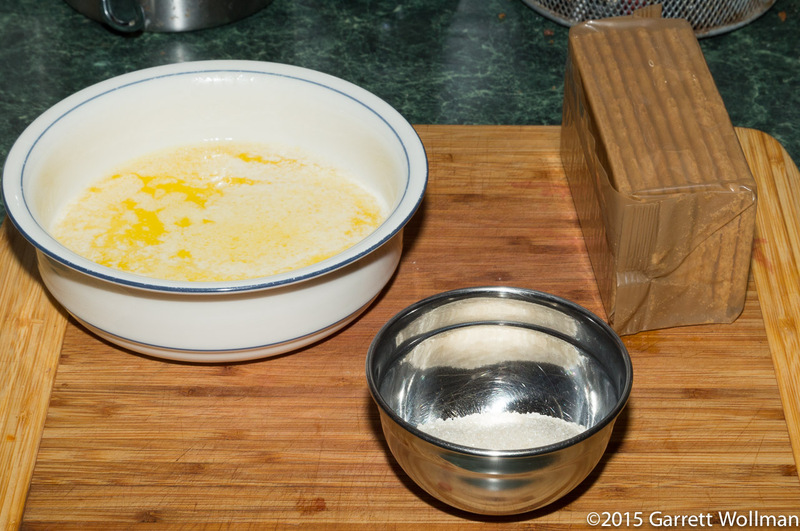 The caramel sauce is also quite simple: a half-cup of brown sugar, a quarter-cup of heavy cream, and ¾ tsp of melted butter are cooked together in a small saucepan over medium heat. 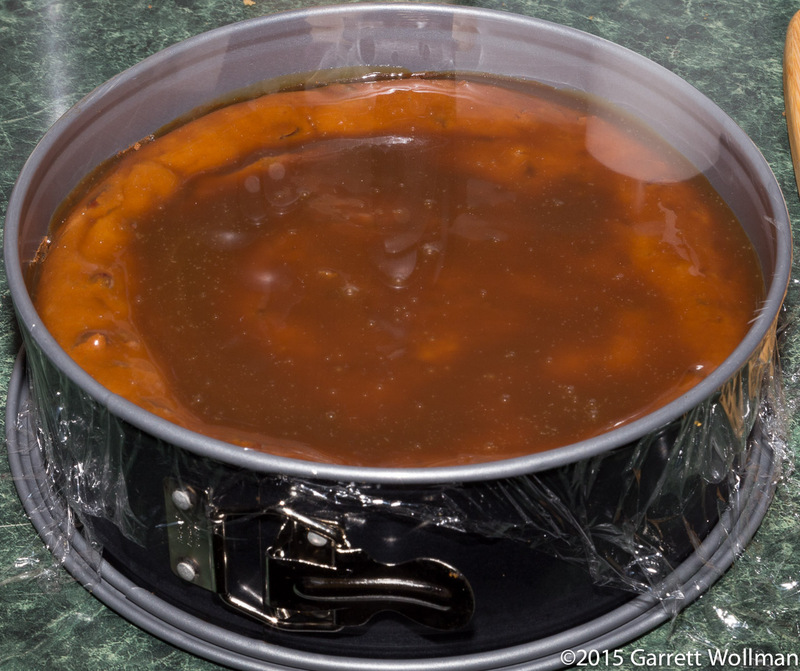 The sauce is cooled slightly and then poured over the top of the cheesecake. 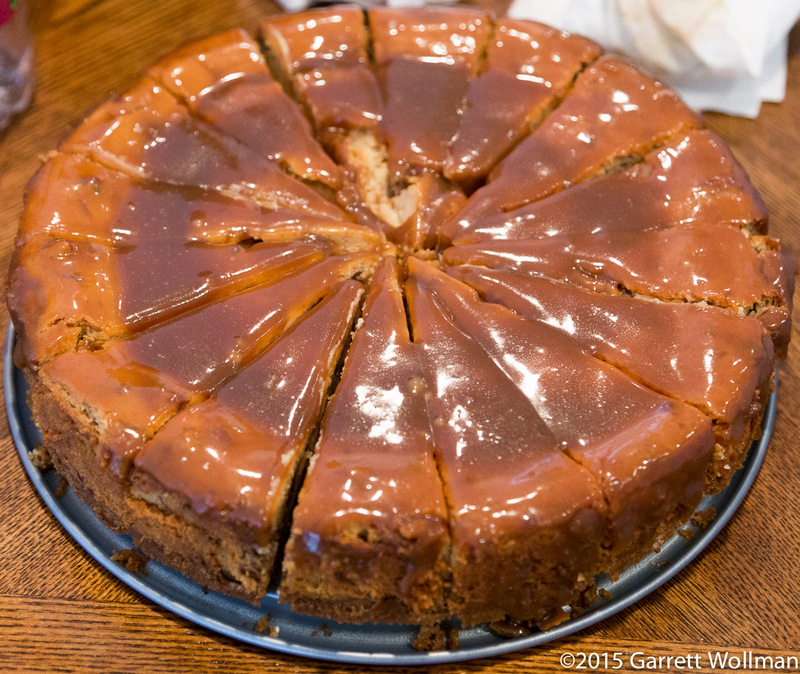 The caramel sauce thickens fairly quickly after hitting the cold cheesecake, and since the filling sinks and forms a well in the center of the pie, it’s necessary to tilt and rotate the pan to coat the entire top surface. At this point, it should be kept at room temperature for another two hours before serving. I divided the cheesecake into 16 portions, although (of course) some people felt the need to cut them even smaller. The best way to cut cheesecake is to get a long knife, a towel, and a tall glass full of hot water; for each slice, rinse the knife in the hot water and wipe it clean with the towel before cutting. 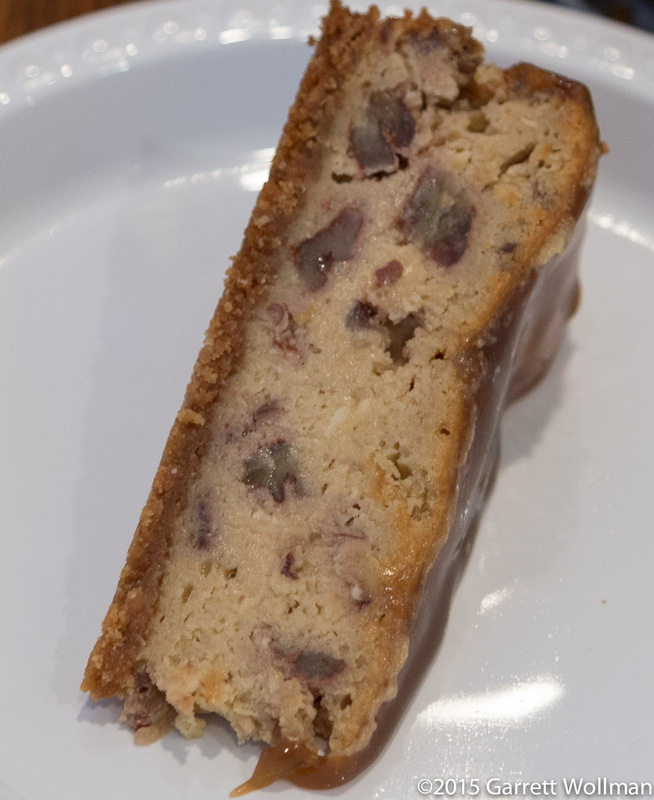 In this single slice you can see how nicely the chopped pecans are distributed throughout the filling. Everyone who tried it (and some of my mother’s family are notoriously fussy eaters) loved it, or at least claimed to. I was pretty pleased with it myself, and the whole pie was gone within an hour of service. You could probably try making this with Neufchâtel in place of the cream cheese for a lower-fat option, but at 400 calories overall it’s really not that bad as cheesecakes go. 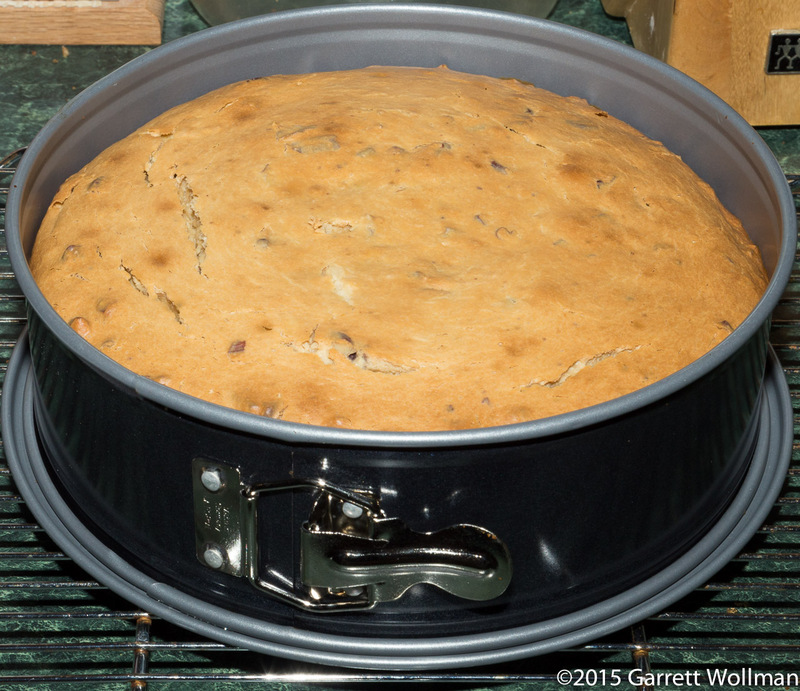 Gallery | This entry was posted in Food and tagged cheesecake, family, Judy Rosenberg, recipe. Bookmark the permalink.